Interview: 36 | Trends & Tactics China to Surpasses U.S in Data Generation by 2025. Apple, Goldman Sachs brings credit card and iPhone CollaboVirtual human' technology teaches employees softs skills. Samsung to launch a wearable smartshirt. 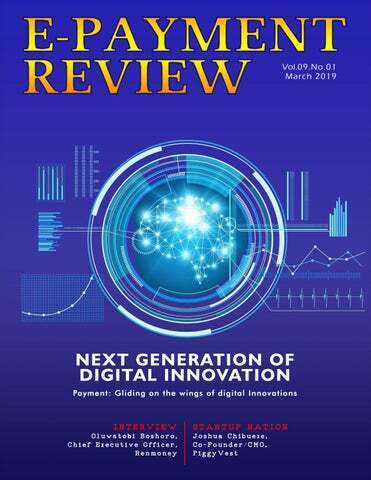 THE NEXT FRONTIER OF INNOVATION THIS EDITION OF THE E-PAYMENT REVIEW IS A VERY SPECIAL edition for me, because I had to sit on the editor's desk and put together an entire publication on my own without the help of my editor. Being the first time running sole, I had to put all my skills to work to ensure that your favourite magazine meets the standard that you are used to and I hope I did a good job of it. In this edition we took a deep look at digital innovations and how it was influenced from one industrial revolution to the next. In the last few years, we have witnessed technological explosion and the use of these technologies has resulted in a phenomenal transformation of the financial world. The change in financial services is happening faster than ever before all thanks to technology. Businesses are taking advantage of the fourth industrial revolution to leverage on a range of nextgen technologies such as artificial intelligence(AI), the Internet of things (IoTs), big data analytics, virtual and augmented reality, voice, enhanced biometrics, robotics, quantum computing and blockchain to offer consumers new ways to deal with their daily financial journey in a simpler, convenient and faster way. Now more than ever, robotics and AI are being used to reduce cost and mitigate risks as well as other functions such as emotional intelligences, logical reasoning, navigation, pattern identification, language processing and lots more. As time goes on, more technological and advance uses of these technologies are going to impact other sectors like capital markets, insurance and wealth management in a big way. Now, putting the customer at the centre of all activities in the world of payments, both banks and new players are beginning to realize the role of cutting-edge technologies as a competitive edge to upend new players and offer financial services in a contextualized environment. Customers will always need banking services but may not necessarily turn to banks to fulfil their needs. We are already seeing technology integrations such as artificial intelligence and big data analytics prevalent in providing financial institutions insights on the kind of personalized services the customer craves and how they deliver it exquisitely One of the major cravings of customers today is access to finance. We interviewed the MD of Renmoney who shares with us how by applying innovation, they have grown their business and do you know the implication of that? More people who approach them can get access to credit for personal and business use. There is a direct correlation between access to credit and it impacts positively the economic growth of the nation. She also shares her thoughts on how organizations can strategically use technology solutions to improve the customer experience while charting a path for tomorrow. I advise you read through the interview and gain more insight into the world of credit and innovative strategies for businesses. We also interviewed Joshua Chibueze, Cofounder of PiggyVest on how PiggyVest automates savings and instil discipline in the users of the app, the platform's expansion plans and what its new range of investments could means for millennials'. Finally, our cover gliding on the wings of the digital innovation takes us through the industrial revolutions, the prevalent innovations in the financial world right now and a call to action on what Organizations and Nigeria as a country can do to avoid playing catchup or being swept away by the next wave of technological change. L-R Irene Netima, Company Secretary FirstBank; Folake AniMumuney, Group Head Marketing and Corporate Communications FirstBank; Dr. Adesola Adeduntan, CEO FirstBank; Rosie Ebe-Arthur, Group Head Human Capital Management and Development FirstBank ; Oluwatoyin Akinwuntan, Group Head , CBG (Energy) FirstBank at the launch of First Women Network. L-R: Executive Director, Commercial Banking, Ecobank Nigeria, Mrs Carol Oyedeji; First Vice President, Chartered Institute of Bankers of Nigeria (CIBN), Mr. Bayo Olugbemi; Managing Director, Ecobank Nigeria, Mr. Patrick Akinwuntan; President / Chairman Of Council, CIBN, Dr. Uche Olowu; Registrar /CEO, CIBN, Mr. Seye Awojobi, Executive Director, Corporate Bank, Ecobank Nigeria, Mr. Akin Dada and Member Governing Council, CIBN, Mr. AbdulRahman Yinusa, during CIBN stakeholdersâ&#x20AC;&#x2122; engagement with Ecobank Nigeria in Lagos. Number of active subscribers on the telecommunication networks as at January 2019, as against 172,871,094 recorded in December 2018, according to the Nigerian Communications Commission (NCC). The data also show that, 173,625,306 of the 174,012,136 active numbers subscribe to the Global System for Mobile Communications (GSM) network services. If you've got a comment about our stories or an important issue regarding payment simply contact us. E-mails should include the writer's full name, address, e-mail and phone number and may be edited for purposes of clarity and space. story. We also believe that employees at all level are the essence of our organization and their full involvement enables their abilities to be used for mutual benefits. We also strive to develop products and services which result in superior customer satisfaction so as to achieve and sustain leadership in the industry. How does your Organization keep up with changing technology trends? Technology is an unavoidable and critical part of any business and ours isn't an exception. Over the years, we have ensured we are not reactive when it comes to the latest trends in technology rather, we are proactive. During the cause of our business, we realised that Research and Development plays a very important role in the success of any business. Therefore, we had set up a robust R&D unit where new products are constantly being researched and developed and existing products are being updated. We are also predictive such that from listening to customers' needs today, we can tell what they would want tomorrow. We are very flexible, fast and adaptive such that even if we do not play a pioneering role we are quick to catch up. A concept for us is that of “Never Stop Learning”. The moment you stop learning and updating your knowledge, whether it is software development or any other category, you will start to regress because you won't keep up. What technological trends do you see driving the e-payment industry in 2019? In your opinion, which is more important to have leadership or sound managerial skills and why? In my view, sound leadership skills are more important than managerial skills. Leaders own the dream, they inspire and motivate people towards a common purpose which is transforming the dream into reality. Leaders strive for a win-win situation for all by winning the hearts and minds of followers and connecting with people on a human level. Managers, on the other hand are concerned about creating goals, managing risks and driving business outcomes, mostly by veto. While this is not bad, it has the potential of achieving only short-term results and creating disgruntled employees, hence, I think managers must also be good leaders to drive sustainability for their businesses and maintain a loyal and motivated workforce who can grow the business. What kind of activities do you enjoy the most when you are not at work? I spend time with family and friends, research on new things whether related to my work or not, I love knowing a bit about everything. I like fixing things myself (DIY). As an engineer, I would say I am a bit too hands-on fixing stuffs, ranging from my car, generator, electrical equipment and gadgets in the house, wood works etc. I like having fun too – general work-life balance. What is that thing that only a few people know about you? I am a very compassionate person, though I put up a front so that people do not take advantage of it. Let's say we are in 2035 and Itex is in the league of Google, Amazon, Facebook and Apple. What would you have done right to get there?  Two keywords- Innovation and simplification. Every forward-looking organisation in the e-payment or technology industry certainly needs to be one step ahead, as the challenge of today and the future require organisations to constantly re-invent their processes and drive changes that are not only suitable for today but for generations to come. This is only possible through innovation. Customers also want simpler and faster processes. This is why at Itex we continue to work towards speed, simplicity and innovation and with quality in mind, so do not be surprised if we become world class players like the companies you have mentioned 10 years ahead of 2035. 80 million Number of young people to beneﬁt from the growth of ecommerce in Africa by 2030 according to a recent report by MasterCard foundation in partnership with BFA. 5G IS EXPECTED TO REACH 30MILLION subscription to enhance mobile broadband in the Middle East and Africa (MEA) by 2024. This will make 5G the fastest generation of cellular technology, representing 2% of total subscription, according to latest MEA edition of the Ericsson (NASDAQ: ERIC) Mobility Report. Key factors driving 5G deployment include increased network capacity, low cost per gigabyte and new use case requirements with majority of the 5G subscription in the MEA are expected to come from GCC countries with advance ICT markets like Saudi Arabia, UAE and Qatar while South Africa will likely lead in Africa. From a mobile data traffic point of view, the region is globally the highest with nine times growth forecast (1.8 to 15.4 EB/month from 2018 to 2024). The MEA region telecom market is currently characterized by increased uptake of LTE and high usage of apps. Therefore, significant growth is expected in data consumption including large mobile broadband subscription addition. FINANCIAL TECHNOLOGY STARTUPS HAVE raised $39.57 billion in Venture funding globally in 2018, making a 120 percent increase from 2017. A report by CB Insights says the funding was raised via 1,707 deals from the 1,480 in 2017. The megadeal funding was driven by 52 deals that were bigger than $100 million and 35 percent of the total funding in 2018 was from the $14 billion investment by Ant Financial the payment affiliate of Alibaba, the Chinese eCommerce giant. The U.S. stayed at the top of the chart with $11.89 billion in funding in 2018, with 659 investment deals. Asian FinTech saw the largest increase in the number of deals, with growth of 38 percent in 2018 and raised a record $22.65 billion from 516 deals, while Europe saw a decline in deals but an increase of funding to $3.53 billion, also a record. On the whole, Venture Capital funding declined in the Q4 but higher than 2017 level the report showed. Access bank to Issue ﬁrst ever Standard Certiﬁed Corporate Green Bond in Africa. ACCESS BANK PLC HAS CONCLUDED PLANS TO ISSUE CORPORATE GREEN BOND IN AFRICA WORTH n15 billion following the approval of its Book Build request by the Securities and Exchange Commission (SEC). Green bond is a bond reserved for climate and environmental projects. The bonds are asset-linked and backed by the issuer's balance sheet, and are also referred to as climate bonds. Access Bank has a B2 rating by Moody's and verified by PwC (UK) following certification by the Climate Bond Initiative as having met the Climate Bond Standards. The issue proceeds would be used to finance eligible green projects that meet the Climate Bonds Initiative (CBI) standards. “The Issue will serve as a turning point for Nigeria, attracting both domestic and international investors and will set the pace for other Nigerian corporates to raise green capital,” said Wigwe, CEO of Access bank. Free WiFi for customers : L-R Group Head, Corporate Bank, United Bank for Africa (UBA) Plc, Akinyemi Muyiwa; Group Head, Online Digital Banking, UBA Plc, Austine Abolusoro; Country Director, Google Nigeria, Juliet Ehimuan-Chiazor; Executive Director/ Group COO, UBA Plc, Chukwuma Nweke; Group Head, Marketing, UBA Plc, Dupe Olusola; Head, NBU Partnerships SSA, Google Nigeria, Saidu Abdullahi; and Group Executive, Digital & Consumer Banking, UBA Plc, Anant Rao, at the launch of Google Station, a Collaboration between Google and UBA to provide free, high-speed Wi-Fi hotspots at UBA Business Offices for the use of customers and publics, starting with 11 UBA branches in Lagos, at the UBA Head Office. STANBIC IBTC BANK PLC IS PARTNERING WITH the Enterprise Development Centre (EDC) of the Lagos Business School, to host a capacity building series tagged: 'Agri-Business Small and Medium Enterprises Investment Scheme (AGSMEIS).' The move by the financial institution is in furtherance of its commitment to help stimulate and grow a strong and viable small and medium scale enterprises sector in Nigeria. The programme targets operators in agric businesses in the country and offers a wide array of banking solutions as well as funding, skills acquisition and other support to the SME sector. The Agri-Business Small and Medium Enterprises Investment Scheme is an initiative of the Bankers' Committee to provide support to and complement the federal government's efforts at promoting Agribusinesses/Small and Medium Enterprises as a vehicle for sustainable economic development and employment generation. AGSMEIS initiative requires all deposit money banks to set aside five per cent of their annual profit after tax (PAT); and as of December 2017, about N26 billion had accrued from all deposit money banks for the scheme. The fund is domiciled with the Central Bank of Nigeria and applicants are expected to be trained and certified by any of the CBN approved Entrepreneurial Development Centres which include the Lagos Business School, House of Tara, Fate Foundation, Thrive Agric and others to access the loan. FUNDING TeamApt Raises $5M funding, Acquire Switching License TEAMAPT A FINANCIAL TECHNOLOGY COMPANY HAS RAISED $5.5 MILLION IN CAPITAL IN A series a round led by Quantum Capital Partners. The software development company intends to expand its white label digital finance products and pivot to consumer finance with the launch of its AptPay banking app. Founded by Tosin Eniolorunda, TeamApt supplies financial and payment solutions to Nigeria's largest commercial banks — including Zenith, UBA, and ALAT. TeamApt, whose name is derivative of aptitude, bootstrapped its way to its Series A by generating revenue project to project working for Nigerian companies, according to CEO Eniolorunda. “To start, we closed a deal with Computer Warehouse Group to build a payment solution for them and that's how we started bootstrapping,” he said. IN SHORT Germany has by far the largest current account surplus in three consecutive years with 294 billion dollars in 2018. The second is Japan with 173 dollars while Russia comes third with 116 billion dollars the Ifo figures showed. TymeBank records R10m Transactions on Day 1 of going Live TYMEBANK, ONE OF SOUTH AFRICA'S DIGITAL BANKS has recorded R10M of transactions on day one of going live. TymeBank sees itself as 'SA's first digital bank' and aims to disrupt the industry with `simple, accessible and affordable banking'. The bank which had a soft launch in November last year, already has 80 000 customers. Owned by African Rainbow Capital (ARC), a company within business mogul Patrice Motsepe's Ubuntu-Botho Investments stable, making it SA's first majority black-owned bank. ARC bought the business from the Commonwealth Bank of Australia in November 2018. The bank already has over 500 kiosks in the market. Once it completes its rollout, there will be approximately 730 TymeBank points of presence, where customers can open accounts, and over 10 000 till points across 1, 500 stores, where customers can withdraw and deposit money. Customers can open a fully FICAcompliant bank account and receive their personalised Visa debit card at a TymeBank kiosk in less than five minutes, or they can open an account with limited functionality on the TymeBank Web site. South African retail banking industry is set for a shake-up this year with these digital banks Zero, Tymebank and Discovery Bank playing in the space. Express Minds Launches First Bitcoin ATM in Botswana Express Minds Limited a local crypto company just launched the first Bitcoin Automated Teller Machine (BATMs) in Botswana. Though Africa currently has not adopted virtual currency much, Express Minds is looking into the future and expects the use of virtual currencies to pick up soon. So far, consumers in Botswana that has an interest in using cryptos usually fly to their neighbouring countries in Africa to buy cryptos. This demand and need for convenience in cryptos necessitated Express Minds ltd to take the bold step. The company intends to avail 12,000 bitcoin ATM to give convenience to the citizens of the country. Daily transaction volume limit is around $5,000 or 50,000 BWP. As explained, the company plans to place the machine in the center of the city market in Gaborone– to give attention to the virtual currency. Once the transfer is completed, this will be the 10th BATM in the whole continent of Africa. Goabaone Brose Watlala, Director of Express Minds, said he still believes that the automated machine is the only solution and the answer towards crypto adoption in Africa. Since the country has still no regulations regarding cryptocurrencies, the chance of Botswana's advancement in virtual money can still be considered. SAFARICOM SIGNS DEAL TO PAY WITH M-PESA ON ALI EXPRESS SITE SAFARICOM HAS SECURED A deal that allows customers to pay for online shopping on Aliexpress.com site. The deal with Ant Financial, an affiliate of Alibaba, will have M-Pesa as one of the payment options with transactions denominated in Kenyan shillings, Safaricom said in a press release. “The move especially targets micro traders in the country who source goods and other supplies from manufacturers in China,” Safaricom said in a statement. Safaricom, Kenya's largest operator that is partly owned by South Africa's Vodacom and Britain's Vodafone, said the deal was part of an effort to transform M-Pesa into a global payments platform. MPesa has become a major profit driver for Safaricom. M-Pesa was launched more than a decade ago to offer Kenyans without bank accounts a network to transfer cash via mobile phone. Other services include payment services, loans and savings to more than 21 million people in Kenya. Safaricom has 30 million subscribers or 65 percent of cell phone users. Ronke Kuye The Bankers' Committee has appointed Ronke Kuye, as the first CEO of Shared Agent Network Expansion Facility (SANEF), an initiative of the CBN to accelerate financial inclusion in Nigeria. Until June 2014, Kuye was the former General Manager in Guaranty Trust Bank as head of the transaction services division. Prior to this, she was responsible for the e-business and card services where she set up a successful card business and alternative channels of payment. 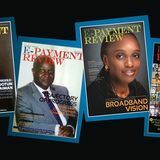 Kuye's notable achievements include the launching of the first Naira denominated MasterCard (accepted worldwide) in Nigeria, the first MasterCard World card in Africa, the first pin-pad devices used for pay and receive in bank branches and setting up of a successful Centralised Processing Centre (CPC) in GTBank. Esaie Diei Enhancing Financial Innovation and Access, (EFInA) has appointed Esaie Diei as its Chief Executive Officer. Prior to his appointment in January, Diei was CEO, MoneyMaster Limited, a Globacom subsidiary focused on digital financial business. He has occupied various positions such as Group Head, Mobile Financial Business, Group Head, Prepaid Card, UBA and Head, Card & Payments, UBA. He is an alumnus of ESCA (Ecole Superieure de commerce d'Abidjan), a highly rated Business School in Cote d'Ivoire in partnership with the University of Brighton (United Kingdom). except you. That's the concept we are able to augment. We also introduced a new feature called track it- an expense tracker. It even sends a daily reminder for you to track your expenses. Those are most of our features and there is a whole lot more to come. What new services should we expect to see right now and in the near future? We are morphing into a more holistic platform not just for savings but offering more investments. We are looking at other opportunities like SMEs, agriculture, mutual funds, real estate, dollar bonds and other forms of investments that millennia's will like to take advantage of. We are going to be working with already established investments partners to achieve this. Are any of these investments you mentioned operational right now? scam when it is possible at that time the banking process may have been down. We encounter these challenges, so you have to communicate with the customer. How do you see the company evolving in the next 5-10 years?You know how you want to watch TV you get a DSTV, it will be the same way when you want to handle your money, you think PiggyVest. I see us evolving even using AI and machine learning for financial advisory, giving you a monthly report on how you spent your money this month or helping you think how you can earn better with your finances. There are a lot of things we have to go through and it's not going to be easy but we will get there. We have the tech and our tech team is very solid. We launched a new app last year and by the end of the year, we were number one in terms of finance in Nigeria. So, in the next 5 years, I see Piggy Vest as a household name with millions of users, helping them to invest their savings. Basically having a big impact on how millennial save and do better with their money. What technologies do you see redeﬁning the payments space? The payment space needs a lot of disruption and I like the newly introduced PSB licenses. I see a lot of opportunities for the grassroots to become part of the financial system. The major challenge for the grassroots is accessto credit. If they are included in the system, they can get a good rating to access credit and the economy is better off. For AI and machine learning, they are a means to an end. I'd like to see a central wallet system like Mpesa that will include everybody in Nigeria and be able to keep track of the entire money flowing in the system. I think is going to be the game changer though not many people share this school of thought. Secondly, we need to organize our identity in Nigeria; it will help payments a whole lot as BVN is getting out-dated. You may have moved houses two or three times or even change your phone number and the banks don't have the current information. If someone does something on the road and I can track that person, then that is progress. Aboard there is law and order because you can identify everybody. So, Identity and a central wallet would be the game changer. characterised by innovative business models which crystalized such concepts as cybersecurity, e-commerce, workflow automation, social media analytics, and the likes. The third wave, which has been identified in some quarters as the fourth industrial revolution, is what we regard as the next generation of digital innovation. The fourth industrial revolution refers to the increasing integration of digital systems, networked communications, machine learning and large-scale data analysis, into business operations and processes in order to make them more efficient and selfsustaining. The current pace of technological development is exerting profound changes in the way people live and work. It is impacting all disciplines, economies and industries, including how, what, why, when and where individuals produce and deliver products and services. build a pyramid of cynicism in the minds of customers at the midpoint of the second wave of digital innovation. However, with the advent of big data analytics, customers can rest in the assurance that even if, for example, an unauthorized person tries to initiate an electronic payment on his/her account from a different location, his bank might be able to use location tracking application to recognize that the customer is initiating a transaction from a different location, and therefore either block the transaction directly or send a direct mail to the customer for further verification. This is a very typical example of how digital innovation could come handy in risk management, especially in the financial sector where operational risks are on the high side. A closer look at some of these innovations and their effects on the country's financial sector brings observers to a close discovery of a significant improvement in operations and service delivery over the past decade. One digital innovation that exists today as a framework for the next generation is the Internet of Things (IoT). Internet of Things is driven by a combination of forces, including the exponential growth of smart devices, a confluence of low-cost technologies (sensors, wireless networks, big data and computing power), pervasive connectivity and massive volumes of data. It is a digital innovation that allows users to automate their routine operations by networking all physical, tangible devices through the aid of a sensor or software as the case may be. Internet of Things is already heralding transformation across industries, and experts and solution providers have submitted that it will bring about even more significant changes in the coming years, which falls within the purview of the next generation the financial sector, some of the gadgets that have revolutionized the industry include banking applications on smartphones, digital assistants, finance tracking applications and contactless payment desks, etc. The proliferation of smartphones and other hand-held devices by users has amplified the use of Internet of Things, which in turn empowers the innovation and change the manner of business operations. In a study on the growing mobile technology, as reported by Tusher Vijay of Konstant Infosolutions, a section describes the impact of Internet of Things as a growing phenomenon in the banking sector especially. The vital figures include the fact that 64.5% of worldwide banking officials monitored their clients through portable applications on smartphones, tablets and other advanced gadgets. While the figures are not ascertainable in the Nigerian banking sector because of the paucity of empirical research in that field, ethnography of proceedings provide sufficient evidence of how smartphones and other portable devices have offered timely assistant to customers through the Internet of Things. With the advent of the Internet of Things, a number of financial or economic related concepts have also gained prominence. One of such concepts or new field in the financial sector is FinTech (financial technology), which basically describes how organizations deploy technology to birth innovations in the financial services ecosystem. FinTech generally aims to attract customers with products and services that are more userfriendly, efficient, transparent, and more automated than what obtains. FinTech operates in segments, but the more visible and easily relatable segment in the Nigerian environment would be the other alternative payment systems, different from the familiar banknotes, cheques and internet banking, that the technology has offered financial institutions and their customers. The vibrancy of this segment in the Nigerian environment is of course made possible by the obvious cause of Nigeria being colossally a cash-based society, which is gradually been put under check courtesy of the demand for cashless society by the Central Bank of Nigeria. From the year 2017, the country has witnessed a convergence of financial services with telecommunication operations, such that with just the fusion of a bank's approved code and recipient's details, transactions could be completed in real-time without necessarily having internet connection. This innovation, as modern as it actually is, provides a rope-a-dope for some constituents of the Generation X who are yet to be brought to speed with internet operability. â&#x20AC;&#x153;ONE DIGITAL INNOVATION THAT EXISTS TODAY AS A FRAMEWORK FOR THE NEXT GENERATION IS THE INTERNET OF THINGS (IOT).â&#x20AC;? Consumers who are willing to shop more frequently when AI is present while 34 percent will spend more money according to AI Trends. other industries and sectors aside from the financial sector, in the new generation. It is projected that both established competitorsand even new entrants will leverage big data analytics to float innovations, to compete and extract as much value as affordable from real-time information accessible to them. By the time the firms from other industries are striving to play the catchup, financial institutions would have upscaled in business intelligence using big data, by driving increased demand for algorithms to process data while also minimizing the impact of the challenges around data security and access control on the extant system. Machine learning, a fundamental subset of artificial intelligence, explains the ability of the computer to adopt a pattern (learn) of behavior online without necessarily being programmed to do so. This innovation thrives on the ability of the computer to recognize patterns and behaviors by learning from experiences. It is used, especially in artificial intelligence, towards solving a problem with little or no human intervention or interference. Machine learning is also proving critical in enhancing innovativeness in business operations and economic activities across different sectors and industries today. A good example is its application at Dubai airport - where machine learning is building the airport of the future. Dubai is using advanced machine learning techniques, powered by Splunk's Enterprise platform, to transform the airport experience from start to finish. An H2O.ai report opines that Artificial Intelligence and Machine Learning is particularly useful in financial service because myriad benefits are derivable from it, which continues to grow on a daily basis. Notable examples of its deployment are in the Anti-Money Laundering campaign, where techniques such as behavioral modeling and customer segmentation are used to discover transaction behaviors with a view to identifying behavioral patterns of entities and outlier behaviors that detect potential laundering. Experts have submitted that this innovation is more reliable in anti-money laundering campaign than the traditional monitoring system. Amount businesses will cut in cost using Chatbots by 2022 according to forecasts by Impact bond. Digital Assistants $15.79 billion Digital voice assistants market growth by 2021 from $5.21 billion in 2018.
with an enterprise without interacting with a human by the year 2020, thanks to Artificial Intelligence powered Chatbots. Going by these developments over the years, digital innovation will continue to automate processes and make operations in various sectors or industries seamless. These will, however, curb inefficiencies, reduce costs, improve production and as well minimize waiting time in various industries and sectors. The latest wave of digital innovation will now revolutionise traditional industries just like past waves of innovation have reshaped industries and sectors like finance, information and media. Predominantly, the finance sector has been a front-burner with respect to the deployment of Information Technology and digital innovations in businesses. The mystery behind the development of this sector over the years lies in the adoption of digital innovations for birthing improved services such as mobile and internet banking. Also, the deployment of various products and services by the new entrant also called FinTechs has reduced the extent to which physical cash is handled, thus handing us a glimmer of hope for a successful cashless society and financial inclusion. With these levels of impact on the financial industry, the future guarantees a reduction in the use of cash for business transactions to the barest minimum. The current digital innovation in the financial sector will also enable financial institutions and merchants to use data-driven customers' engagement platforms. COMPANIES STILL OPERATING IN THE OLD PARADIGM MAY SPEND A BULK OF THE TIME PLAYING THE CATCHUP, WHEN THEY SHOULD BE GLIDING ON THE WINGS OF THE TECHNOLOGICAL WAVE; AND THE SAME FACT HOLDS TRUE FOR COUNTRIES. Amazon's machine learning algorithm has successfully decreased the “click-to-ship” time according to Forbes. Accurate detection of breast cancer by Google's Deep Learning machine compared to just 73 percent accuracy from a human pathologist from Health IT Analytic. 12.5 percent An person's average working week, or the equivalent of 11 days' a year, lost in data collection as estimated by Statwolf. Autonomous Vehicle $6 billion Growth of global autonomous vehicle market in 2025 according to Statista. that optimising the use of digital skills and technologies could generate $2tn of additional global economic output by 2020. The study also revealed the vast role digital technologies play in economic activity, with more than one-fifth of the world's GDP attributable to digital skills, capital, goods and services. Nigeria, no doubt, is one of Africa's most promising nations. With over 190 million people, this country remains the largest mobile market on the continent. Over the years, the country has witnessed a surge in and growth of e-commerce businesses, an increase in small and large scale enterprises, not to mention a ton of mobile-based services that meet a wide range of needs for people every day. The further popularisation of businessdriven technologies – such as those already highlighted and briefly explained in this article – is putting pressure on companies and businesses in different sectors to fundamentally rethink operating models, business models and executive roles, regardless of industry or geographical location. The next generation of digital innovation demands the attention of Nigeria now more than ever before. Evidences abound across the globe that developed countries and leading businesses and multinationals are already reaping the productivity benefits of digital innovation, and Nigerian businesses across different industries must embrace the kinds of digital innovation that will position them for catchup with global leaders. Anything short of this, businesses and the country as a whole may continue to fall behind in economic terms. However, in the new generation, there is proposed to be a broader economic imperative because the core technologies (some of which have been mentioned above) will find real expression by revolutionising the traditional transactional processes, thus birthing greater productivity in sectors where digital innovations are already calling the shot, while inspiring growth on new turfs. Automation market was worth $250 million back in 2016, but is projected to grow to $2.1 billion by 2021 according to Forrester report. Beyond its adoption and application in the financial sector, which we noted earlier as being the pace-setting sector when it comes to the issue of deploying technology to address critical business challenges, there is need for a holistic adoption of digital innovations by other industries and sectors towards having greater social implication or relevance. The starting point therefore, will be to learn about the potentials of the next generation digital innovation and the implications (in terms of value propositions and investment requirements) of the adoption of the technologies to businesses and social system at large. The onus rests on the shoulders of the government of the Federal Republic of Nigeria to support platforms that educate the next generation policy makers, entrepreneurs, technologists and other role players in the country's business ecosystem on ways of integrating In this world where technology serves as a basic facilitator, and consumers run away from complexity, organisations and businesses that desire to succeed or accomplish their goals in the new generation must come to a realisation that they have to change their business model. A satisfactory customer experience means getting their problems solved in real time through convenient channels such as the Chatbots, Artificial Intelligence and Machine Learning platforms. The implications of this integrated experience for companies are complex (especially at the point of initial adoption), because it requires the ability to provide tailored solutions, knowing the context in which the customer is, and to orchestrate the necessary channels to deliver them in a transparent way. However, companies still operating in the old paradigm may spend a bulk of the time playing the catchup, when they should be gliding on the wings of the technological wave; and the same fact holds true for countries.digital innovations into their business plans. MAKING FINANCIAL INCLUSION COUNT IN DIGITAL LENDING SPACE Renmoney CEO, Oluwatobi Boshoro on innovation as a strategy to power seamless customer engagement across channels while impacting the bottom of the pyramid. BY LUCY AKOKOTU Could you give us a brief introduction of yourself and renmoney's role in the nigerian ecosystem? My name is Oluwatobi Boshoro and I'm the CEO of Renmoney. Renmoney is a fintech lending company in Nigeria and we make financial inclusion count through the loans, savings and deposit that we give and receive from our customers. For us, we believe that financial inclusion is about enabling that person to have access to funds and grow their business or personal needs which is why we think that what we do make financial inclusion count. We want to empower average Nigerians with convenient credit to grow their businesses and manage personal needs. Creating an omnichannel customer experience is at the heart of present and future strategies for ﬁnancial services ﬁrms. How does Renmoney align its services ofﬂine and online around this? The first thing we have done is to internally streamline all our processes so all our customers' interactions are managed through our CRM tool. What we have done is to ensure that all our customers can be served the same way across board, on whatever touchpoint they contact us through. So, whether you visit our offices, engage with us on social media or call us, you get the same service experience. This allows us to have a comprehensive view of the customer at every point of their journey with us. Early this year, Renmoney extended credit facilities to Micro-Small Business Enterprise Loans for business owners. What has the customers' response been like? Like I said earlier, we are very keen on making financial inclusion count particularly for an unserved segment of the market. Over 70 percent of Nigerians are employed by Micro, Small and Medium Enterprise so if we want to impact the economy directly, that segment needs to have access to credit to grow their businesses. We desire to address the challenges faced by small businesses through access to credit which are some of the reasons why we have done this. A lot of research, testing and hard work went into creating this product, and during the six month period of testing this product, we reviewed over 30,000 applications and issued over 6,000 loans. The response has been positive so far. account for some time, is it possible for her to beneﬁt from your Micro-loan? One of the things that is very important to us is to understand your earning power. It is a key factor in our decision-making process as the earning power of the customer, tells us how much you can conveniently repay. With a recent bank statement we can assess your financial position and, if you meet our criteria, irrespective of your line of business, we will do business with you. Could you explain how the process to get a loan works and how much time does it take to obtain the loan? Getting a Renmoney loan is very simple. You can go to our website or visit any of our locations in Lagos. We just need a recent bank statement, a valid means of identification and any recent utility bill as proof of where you currently live. With this, in a few minutes, we can determine if you are eligible for a loan or not. Do you have any plans to expand across the market? We are constantly exploring opportunities so expansion is something that might be considered down the line. RenMoney made the London Stock Exchange Group list of 'Companies to Inspire Africa' for 2019. What did you do right to earn this recognition? The first thing I will say what we did right last year was to become an outside-in Organization. This means that we listened to our customers and then worked our processes to fit the needs of the customers. We put the decision making in the hands of the customer, and they tell us how they want it, when they want it and why they want it. With this, we served our customers better and in the last 12 months we have been able to provide 100,000 loans to customers by bringing convenience to the customer. This got us noticed by the London Stock Exchange Group team. The inﬂux of ﬁntechs companies providing similar ﬁnancial services directly or in partnership with banks creates an efﬁcient and resilient ﬁnancial system but at the same time, intensiﬁes the competition especially for incumbents which may lead to additional risktaking in order to maintain proﬁt margins. Which other industry can ﬁntechs diversify to in other to reduce the proliferation of the same services? COVER INTERVIEW It is important to carefully choose your digital KPIs. Choose what is important to you at the time as there are a lot of applications in the market. Firstly, as a business, you should understand the level of service you wish to provide to your customers and the digital technologies that will enable you achieve this. I will always say listen attentively to your customers and work with their feedback. The feedback from the customer will enable you to deploy the right technology to help you serve them in the way that they want to receive your service. Secondly, it is also important to monitor the impact of new technologies on processes and people and how it helps you to be cost-effective and efficient. Yo u m e n t i o n e d f e e d b a c k f r o m t h e customer. How do you analyse customers' feedback to get insights into what they want and how they want to be served? We have something called customer journey. We look at the journey of the customer through our CRM and analytics platforms as well as periodical surveys and feedback channels. All these helps us to understand how they engage with our services and allows us to leverage technology to serve our customers better. What nextgen technologies/trends do you see disrupting the industry in the next 2-5 years? The ability to analyze and generate actionable insights from big data will certainly aid disruption. With big data, companies will have more insights about their customers and be able to serve them better. “WITH THE CLARITY OF ROLES, STRATEGY AND SUPPORTING THE PEOPLE THAT WORK WITH YOU, YOU CAN MAKE ORDINARY PEOPLE DO EXTRAORDINARY THINGS.” What did you learn from your previous experience that you have applied to your current position? My experience working in different industries shows that people make the world go round. With the clarity of roles, strategy and supporting the people that work with you, you can make ordinary people do extraordinary things. Finding and developing the right talent for your organization is very important. Bonus Question: If you had a day to relax and enjoy yourself, where will you go and what will you do? I would spend the whole day with my kids because they help me relax. They ask questions that make me think about a bigger and better world. note that fraudsters are not sleeping, but consistently looking for ways by which they can compromise a payment system that already has the world watching for its resilience, security and innovation. It therefore requires that all Industry stakeholders should consistently be on the watch, especially around vulnerable areas of which the consumer of these e-payment products will be the focus. Developments in information and communications technology will no doubt significantly change the way we conduct business and conclude payments, a greater part of this change will be driven via the mobile platform, thus increasing exposure of unsuspecting and unaware customers to the do's and don'ts of the e-payments world. On these new channels also comes unique vulnerabilities, and most are directed at the consumer. However, the two that are considered major are highlighted below: 1. Phishing and social engineering Most payment platforms, especially mobile phones are used for a mix of both personal and corporate usage. Mobile phones are gathering more and more information from the customer, which when aggregated, could help to carry out sophisticated attacks. L-R: Christabel Onyejekwe, Executive Director, NIBSS Plc, DIpo Fatokun, Director, Banking and Payment System Department, Central Bank of Nigeria/Chairman, Nigeria Electronic Fraud Forum(NeFF) and Tokunbo Martins, Director, Other Financial Institutions Supervision Department, CBN at the unveiling of the 2017 NeFF Annual Report. These attacks target the user by phishing emails and social engineering exploiting different communication channels (e.g. phone, email, SMS) and data about the user available in the public domain (e.g. social media sites, search engines). The data sought by attackers using social engineering are often payment card data and personal data (PINs) that the user should only know. and files on device) Security awareness, education and communication Do not use public WiFi hotspots for mobile payments Keep OS up to date Do not jailbreak phone . If the Payments Industry must do something, then it is the education of all consumers of e-payment products of their respective responsibilities using; “all effective means to educate consumers and business, including innovative techniques made possible by global networks” (OECD, 1999). The Industry should, as a matter of urgency, embark on multi-agency and inter-governmental cooperation and co-ordination through the design of a methodology detailing guidelines for promoting safety in the e-payments space. Media (print, radio, social media and TV) should be leveraged upon, in the dissemination of this critical information to consumers. The Nigeria electronic Fraud Forum (NeFF) has over the years provided a veritable platform for Industry collaboration in the fight against e-fraud, and the Forum again lends itself to realizing the success of this objective of rallying all stakeholders in executing this major frontier in the fight against e-fraud. The Forum, under the amiable leadership of Mr. Dipo Fatokun, Director Banking and Payments System Department of the Central Bank of Nigeria, will seek to coordinate an industry response to this engagement, as we believe this initiative will be the proverbial stitch in time that saves nine. Babatunde Ajiboye is a Senior Manager with the Payment System Management Department in the Central Bank of Nigeria. He also doubles as the secretary of the Nigeria Electronic Fraud Forum (NeFF). Culled from 2017 NeFF annual report. Plug in devices make laptops and desktops vulnerable to cyber attacks Hackers have developed sophisticated methods and techniques to extract sensitive data by hacking PCs using vulnerabilities with plug-in devices like chargers and docking stations. In a study conducted by researchers from the University of Cambridge in the UK and Rice University in the US, these vulnerabilities were detected mostly in computers running on Thunderbolt ports irrespective of the software OS they were operating on i.e. Windows, MacOS, Linux and FreeBSD. Furthermore, for hackers to target a host machine, plug-in-devices like graphic and network cards can also act as access points as these peripherals have direct access to the DMA-Direct Memory Access. Though some security researchers argue that all modern day computing gadgets come with a feature called I/O Memory Management Units (IOMMUs) which help restrict access to DMA attackers by allowing access only to non-sensitive regions of memory, the research discovered that hackers have become very much sophisticated these days to compromise any protection on the devices. In 2016, technology companies addressed the issue by releasing security updates from time to time but the recent research shows that the main problem remains elusive due to the developments such as a rise in hardware interconnects like Thunderbolt 3 that combines power usage, data I/O and device management from the same port. A TV bug allowed a user through the Google Home app, access a massive list of random accounts, including access to photos Google Photos. This means, someone could have theoretically displayed your photos as screensavers on their Android TV without you knowing it. The user who discovered this bug theorized that the lists of The hotel chain says it worked accounts were other users with the same TV with leading security experts model, but that hasn't to investigate the alert. been confirmed yet. Investigators discovered the intrusion, dating back to 2014, Google is working on a fix and has disabled but also that an unauthorized party had copied and encrypted Google Photos screensavers in the information, and took steps meantime. towards removing it. International hotel chain Marriott has revealed a security breach during which the personal details of 500 million hotel guests was stolen. The breach happened in 2014, but Marriott says it recently became aware of it two days after its staff spotted an alert from an internal security tool about an attempt to access the Starwood guest reservation database in the United States. from theft, but newly published research has found that alarms made by two companies actually make stealing a car easier because of third party appconnected car alarms. A research by Pen Test partners, revealed that smart car alarm models under the Viper brand, made by U.S. firm Directed Electronics Inc., and Pandora Car Alarms, made by a Russian company called Experimental Engineering Factory are hackable. The security vulnerabilities stem from the way systems from both car companies use apps to communicate with the alarm system. A Thursday report from Positive Technologies show critical vulnerabilities that could wreak major havoc to a bank's corporate network by giving attackers access to hack sensitive information that could end up on the Dark Web. More than half (54%) of online banks allowed fraudulent transactions and theft of funds, and all had threats of unauthorized access to client and company information such as account statements and payment orders. Also 77% of online banks had security flaws in their two-factor authentication methods. The alarming thing is that the average cost of an online bank user's data on the Dark Web is just $22, according to the report. This made it easy for the security researchers to easily reset the password on the alarms and take full control of the car.In addition to allowing a potential hacker to unlock car doors and disable alarm and vehicle immobilizer, the access also allows the owner's details to be stolen, the vehicle to be tracked and even microphones in the vehicle to be compromised. Worse still, the hacker can take control of a vehicle while it was being driven, meaning a hacker could cause a vehicle to come to a halt, potentially causing an accident. Both companies have taken steps to patch the security vulnerabilities, but drivers who do not update the software behind the smart car alarms are still much vulnerable. Security researchers at Kaspersky Lab have discovered a new phishing campaign that targets Instagram users by using fake copyright infringement notices to steal their credentials. The email appears to be coming from Instagram threats to delete a users' account unless they verify their account. If users click on the button, they're prompted to input their Instagram credentials. For the double phishing blow, users get a second mail, “we need to verify your feedback and check if your email account matches the Instagram account.” Should users then click on “Verify My E-mail Address,” they're offered a list of email service providers. After selecting their provider, they're are required to submit both their email address and their password for the email account. Worse, if the email account is Gmail, the victims are also handing over access to their entire Google account as well. Thereafter, they can take over your Instagram account and start demanding ransom to give the account back to you, or start spreading spam and all kinds of malicious content using your hijacked account. The solution is to take simple precautions by checking the URL very well and only use the official Instagram app when interacting with the service. Microsoft annual report show Phishing attacks up, ransomware attack Microsoft's annual Security Intelligence Report Volume 24 has analyzed data from 6.5 trillion security signals that go through the Microsoft cloud as well as gathered insights from thousands of security researchers. The report noted that ransomware attacks, along with general attacks using malware, declined by 34 percent in 2018 as attackers shifted from highly visible attacks to more stealth attacks while phishing attacks jumped 250 percent in 2018. Cryptocurrency mining, also known as cryptojacking, is still prevalent but surprisingly, given the ongoing attention it receives, was also found to have declined over the year. The report also noted that software supply chain attacks are presenting increased risks as hackers leverage the trust users have in their software vendors to gain access to enterprise networks. The report suggested that bad actors have shifted tactics in response to the more sophisticated tools and techniques that have been deployed to protect users. technologies often play catch-up with security as they emerge through their early adoption phase. If we look at mobile applications, cloud computing and even personal computers – all these innovations needed to adopt policies and techniques for security,” said Charles Henderson, Global Head of IBM X-Force Red. “However, while blockchain is a breakthrough for protecting the integrity of data,that does not mean the technology and connected infrastructure are always protected from attackers, which is why security testing is essential during development and after deployment” he said. Blockchain technology uses will continue to accelerate provided of course security risks and design vulnerabilities are put in check. Reverse Engineering is one of the best techniques for fighting fraud. Security experts, can apply reverse engineering by looking 'outside in', to understand the vulnerabilities of a software system and if it's easy to breach, then the security expert can recommend how to protech the software against threat. The more business move towards Cloud base storage, the more likely vulnerabilities opens and the risk of data theft increases. Hacker steals $7.7 million in EOS cryptocurrency A hacker has stolen $7.7 million worth of EOS cryptocurrency when a newly rotated top 21 BP failed to apply the blacklist. The hacker moved 2.09 million EOS coins from the hacked account to several accounts at various cryptocurrency exchanges. With the Huobi exchange platform froze, they were able to recover some of the hacked funds but not all. Following the incident, EOS42 is now proposing that the EOS blockchain maintainers replace the shoddy "blacklist" mechanism with a more democratic system where if 15 out of 21 EOS block producers update their blacklist, an account key is nulled, blocking access to the hacked account. Estimated cost of global online crime by 2021 according to Cybersecurity Ventures. Estimated loss to cybercriminals yearly by 2023 according to a report by Norton Security. Email addresses and nearly 22 million passwords compromised in January 2019 from Collection #1, according to a National report. 65% U.S Organizations breached in the last three years while 36% got breached in 2019 according to a report 2019 by Thales Data Threat Report Global Edition. In less than 2 years to the fulﬁlment of the Central Bank of Nigeria (CBN) Payments System Vision2020, this roundtable discussion will focus on what must be done and how the operations of Payment S e r v i c e B a n k s (PSBs), will get us to the promised land of 80% ﬁnancial inclusion rate in Nigeria. serving the most excluded and Improve the adoption of cashlite payment channels, particularly in government-to-person and person-to-government payments. This approach will help CBN to achieve their target of 80% financial inclusion by year 2020. OHIMOR: Change in culture or attitude often doesn't come easy. It's either attractive incentives are offered or there is value in terms of cost savings or convenience that will make the unbanked change their ways. With the use of biometrics, there is no need for cumbersome identification and documentation should be minimized. What else can be done to hasten the Nigeria ďŹ nancial inclusion dream? ADEKANBI: Amongst others is agent channel enablement, improved network management across the country, agent network build-up, real-time service swap, flexible deployment of the strategy to accelerate financial inclusion in Nigeria. OHIMOR: Possibility of a convergence between the National microfinance bank license and the payment service bank license should be considered. This will widen the scope of services by the later and increase its attractiveness to investors. BRAIMAH: The decision to allow Mobile Network Operators (MNOs) to apply for licence will make a lot difference. Results from other climes like Ghana, Senegal and Kenya are clear indications. Nigeria was listed among the World Bank Universal Financial Access (UFA) 25 focus countries. The objective is to ensure that adults worldwide have access to an account by 2020. Our being listed here is a clear indication of how poorly we have done in the last 5 years. Incentives to operators which may include tax reduction or tax holiday for a certain period by granting them pioneer status. These will eventually reduce transaction cost, improve infrastructure and social services. One thing I must add is that the move will have great impact in Nigeria OKOYE: Boost the deployment of POS terminals, ATMs and a harmonized Identity infrastructure in Nigeria. Re-skill the excluded to raise their standard of living. The ATM channel recorded the highest number in transaction volume, constituting about 45% of the entire transaction volume. The Instant Payment contributed majorly in terms of value, being responsible for 68% of the entire transaction value. For more than two consecutive years, transactions via the ATM and Instant Payment platform have outnumbered all other payment products in volume and value respectively. The POS channel emerged third highest in transaction volume after ATM and NIP, and the fourth in transaction value. Again, when compared to 2017, POS transaction volume and value increased by 95% and 65% respectively. Notably, bulk payments recorded the second highest value of transactions in 2018. Bulk payments include NIBSS-based transactions such as Automated Bulk Clearing (ABC), NEFT, NAPS etc. Transaction Summary 2018 An analytical overview on the aggregate of transactions processed through the Nigeria Central Switch (NCS) and Automated Teller Machines (ATM) in 2018 shows an increase of 41.5% in transaction volume and a 21.97% increase in transaction value when compared to 2017. In 2018, a total of 1.9 billion transactions were processed with a transaction value of N118 trillion. An overview of 2018 transactions shows that each month had more transactions in volume and value than its corresponding month in 2017. As expected, the last three months of 2018 recorded the highest amounts in transaction volume and value with December holding the highest transaction count and value with 202 million transactions and N12.2 trillion respectively. In spite of the marginal drop in the volume of foreign transactions for 2018, its transaction value still increased significantly. When compared with 2017, foreign transaction volume decreased by 27% while its transaction value increased by 61%. Remarkably the Web channel recorded the highest transaction volume and value. There was also a significant increase in volume and value of foreign ATM transaction by 34% and 264% respectively. 2018 reported fraud volume is the highest seen in the last four years, with an increase of 55.14% in comparison to 2017. Also, its attempted and actual loss value increased by 124.27% and 27.54% respectively. Financial institutions are encouraged to collaborate effectively in fortifying existing controls to ensure this significant rise decreases in 2019. In 2018, mobile channel recorded the highest fraud in volume and actual loss value. A total of N598.8 million was lost to the mobile channel within the year. Ease of use has made mobile channel the preferred channel for convenience and smart payments. Fraudsters have also employed mobile channel as a major medium of transferring illicit proceeds. Mobile channel fraud took the lead in both fraud volume and actual loss value in 2018. However, in 2017, ATM channel reported the highest fraud in both volume and actual loss value, whereas mobile channel was the third highest reported fraud by volume and the second highest reported fraud by actual loss value. 2018 reported fraud volume is the highest seen in the last four years, with an increase of 55.14% in comparison to 2017. Also, its attempted and actual loss value increased by 124.27% and 27.54% respectively. Financial institutions are encouraged to collaborate effectively in fortifying existing controls to ensure this significant rise decreases in 2019. First quarter 2018 witnessed the largest loss to fraud, with an estimated value of N794 Million. Again, first quarter 2018 recorded the least reported fraud by volume. This same trend mentioned above was recorded in Q1 2017. The highest volume of reported fraud was recorded in Q4 with a fraud volume of 11,247. The second highest actual loss value was witnessed in quarter three and about 35% of attempted fraud value was lost within the quarter. Reported fraud cases across all channels within the last three (3) years can be seen below. Mobile channel recorded the steady increase in both volume and value within the last three years. ATM channel showed slight changes over the last three years. There was a successive increase in volume and value of both mobile and web transactions within the last three years. There was a successive increase in volume and value of both mobile and web transactions within the last three years. The significant peak in mobile fraud is a pointer to the fact that fraudsters have concentrated their schemes on mobile channels. As a result of this development, measures should be put in place to reduce the occurrence of fraud within mobile andATM channels. Taking a look at location (by state) where defrauded individuals reside, the trend continues with states like Lagos, Rivers, Delta, Oyo and Ogun featured atop the list. Lagos records the highest value of 29.83% followed by Rivers state at 6.07%. A total number of 848 unique individuals were beneďŹ ciaries of fraudulent transactions carried out across various electronic channels. These unique individuals were generated from the fraud reported on the Industry Anti-Fraud Portal. Based on reported data a total of 17,632 unique individuals were defrauded across e-payment channels in 2018. This comprises of 61% male and 39% female customers. A total number of 754 fraud cases were reported by Other Financial Institutions in2018. When compared to 2017, there was 16.72% increase in reported fraud volume and 19.53% increase in actual loss value. Also, OFIs attempted fraud value increased by 36.68% when compared to the year 2017. The OFIs were able to salvage 15.54% of attempted fraud value. numbers are connected to bank accounts also increases the risk in the event of phone theft. We envisage more fraud on the mobile channel in 2019 Rogue Apps and Software on Mobile Rogue mobile apps are assumed to be one of the fastest-growing phenomena among cybercriminals. Fraudsters create malicious apps that appear genuine, taking advantage of the trust of customers to access their personal information. This can be viewed as a form of phishing on the mobile platform. Financial institutions will be the major target of such criminal actions in 2019. Stakeholders' Collaboration: In 2019, there is a need for effective collaboration among various stakeholders in ensuring holistic fightagainst fraudulent activities. More often than not, timely dissemination of information about impending and developing threats through stakeholders collaboration plays an excellent role more than just technology deployed on workstations, network or servers. A deep collaboration between Telcos and banks would greatly reduce the success rates of fraudsters. Fraud Management Technologies: Over the years, fraudsters have taken advantage of the weaknesses detected on systems as attack vectors in perpetrating their acts. These fraudsters are expected to step up their game and create more intelligent and powerful attacks than what have been experienced. Deployment of BVN Facial matching and fingerprint verification on channels like ATM and high-end mobile phones would go a long way in assisting to curb friendly /non-friendly frauds. Financial institutions should leverage on the industry anti-fraud solution for ALL their channel transactions (both inter and intra transactions). Fraudsters are beginning to move away from inter-bank to intra-bank fraud schemes. Buoyant banks may choose to invest in the latest technologies and intelligent-based system that can minimize potential risk with minimal human intervention. This must include fraudprevention systems that utilize the strength of learning functionality to stay a step ahead of cybercriminals, instead of retroactively defending against them. The Central Anti-Fraud solution (HEIMDALL) provides this functionality for banks who choose to leverage it. 3. Partnership with the Mobile Network Operators (MNOs): Evidently, in 2018, fraudsters leveraged on Mobile Channel for either a receipt or transfer of illicit proceeds, it also recorded the highest in both volume and actual loss value. As the year 2019 unfolds, we look forward to seeing a seamless collaboration between various financial institutions and Mobile Network Operators (MNOs) in ensuring that various fraud schemes bordering on Mobile transactions are controlled effectively. Also, we look forward to the establishment of SIM swap notifications to financial institutions by MNOs in real-time. 4. Operationalizing the Police Dedicated Electronic Fraud Unit (PDEFU): We would be able to have an upper hand against fraudsters if we have a functional deterrence system. The Police set up a dedicated electronic fraud-fighting unit for the banking industry, this unit has not been operational yet even though the men are available on ground. We would get a good mileage if the financial industry operationalizes the PDEFU as this would assist with deterrence. TRENDS & TACTICS Data Explosion Study: China to Surpasses U.S In Data Generation By 2025 The on-going data explosion around the globe is nothing short of revolutionizing and access to the insights from data will play an important role to create new revenue streams, reach new markets and improve customer service both now and in the future economy. Not only for businesses but counties as A study carried by the International Data Corporation (IDC), a data storage firm Seagate, has found that out that China will overtake the U.S. in data generation by 2025. From the study, China's continuous venture with new technologies, like the Internet of Things (IoT), will outpace average global data generation by 3 percent a year. In 2018, China generated 7.6 zettabytes of data (a zettabyte is around one trillion gigabytes) while the U.S for its part generated 6.9ZB. By 2025, China is projected to grow to 48.6ZB and US to 30.6ZB. “Data may not be on a balance sheet, but data is a company's most valuable intangible asset, which can create a competitive edge in digital transformation,” the report said. Chinese eCommerce companies Tencent and Alibaba, are taking advantages of the troughs of data at their disposal to leverage years of data collected to create more personalized services for their customers. The total amount of new data generated in 2025 is expected to grow to 175ZB, from 33ZB in 2018 with major data source from entertainment, internetconnected devices, productivity tools, surveillance footage and metadata, which is an important part of how data is analyzed. In Short Samsung to launch a wearable smartshirt that connects to your phone and can diagnose lung diseases. Samsung might develop a new smart shirt with built in sensors that can diagnose diseases through a smartphone. The sensors in the shirt can diagnose diseases by detecting sound from the organs through the frequency and strength of breath. For correct diagnoses, the age, gender, weight and height of the user are taken into account. Samsung hopes the wearable smart shirt technology can cut down on doctor's waiting times. Virtual human' technology teaches employees softs skills Talespin an augmented and virtual reality solutions firm has launched a “virtual human technology powered by AI to help businesses train employees in interpersonal or soft skills. When using the platform, employees interact with a simulated “virtual human” in a virtual environment designed to look like a workplace and the virtual human uses AI and natural language processing. ''Barry'' mimics body language, and has a range of human emotions to enable employees practice their skills on how to handle everyday conversation, workplace conflicts and even stressful interpersonal situations for conflicts. “Improved workplace communication and empathy are the most critical factors we've identified as we help organizations think about the future of work,” said Kyle Jackson, co-founder and chief executive of Talespin.. Apple TV Coming Soon Apple is on the curp of redefining the television experience just like it did with phone. Apple is expected to launch its TV streaming service in April or early May. Apple's service will feature free original content for device owners, and a subscription platform for existing digital services. Apple ambition go beyond streaming services to include original content from both live TV and on-demand video accessible on virtually any screen to compete with Netflix, Amazon and others. Unlike anything in the market, its new services are expected to build an infrastructure to host content from cable, satellite, streaming video and live TV companies using servers positioned strategically around the country. Customers will be able to watch content from a variety of sources, all within the iOS TV application. In addition, the company is looking to create a subscription service for news, allowing users to read and publish news at for a monthly fee. A report last month says Netflix and Hulu won't be a part of the service. Apple, Goldman Sachs brings credit card and iPhone Collabo Apple Inc. and Goldman Sachs Group Inc. are collaborating to launch a joint credit card combined with an iPhone that allows customers to better manage their personal finances. The credit card will run on Apple's Wallet app and operate on the Mastercard platform, giving customers the ability to set spending goals, manage account balances and track rewards points. A testing period will commence with company employees before the cards will become available to a larger population later this year. Both companies began discussing the joint credit venture in 2018. In recent times, Apple iPhone sales has been down and Goldman Sachs is competing to get more digital customers through its Marcus product. Insurance cost savings from AI use in claims in 2023. Growth in successful banking interactions 2019-2023. HTC Corp. is now accepting regular cash starting from March, for the purchase of its Exodus 1 blockchain smartphone to the public. The Exodus 1 first went on sale in October and could only be purchased directly from HTC using cryptocurrency like bitcoin, Etherum and Litecoin for $699 and later allowed credit card purchase. Taiwanese phone maker is adding about 20 new applications to the device, including support for ERC-721 tokens, Apps and genesis blocks. Facebook to Advance AI by Creating Its Own Chips Facebook is exploring ideas to create its own chips in other to deliver the type of computing speeds necessary to take the next leap forward in Artificial Intelligence. Though the company is already working with a chip company like Intel on the new chips, it is not ruling out the possibility of developing its own. Yann LeCun, the company's chief AI scientist and a pivotal figure in modern AI, said the company will use AI to help monitor video in real time and assist human moderators with content selection. Not only that, Facebook is also considering digital assistant market similar to Apple's Siri or Amazon's Alexa that can have conversations with users and has “common sense”. Companies like Google and Apple, are already investing in companies in the area of chip specialization. Das smart keyboard aids Das Keyboard has announced updates to its “Q applet” marketplace for information technology professionals and developers. The Qapps allow developers to set triggers that will change the color of their keyboard when certain events like new email, push pop-ups from websites, alarms occur. The idea is that these apps will permit developers to turn off all of those annoying notifications and instead important notices programmed by the user will appear on the keyboard. Schools around the developed world are increasingly criticised for killing creativity and for their rigid approach to teaching. On the flipside of the coin, 72 million children of primary education age, mostly in emerging markets, are not in school. It's not all rainbows and butterflies though. Long sale cycles set Edtech back; it can take years to test, sell and improve an Edtech product. Furthermore, scaling could prove to be an issue. A product that helps education in a certain country might not necessarily be useful beyond its borders. Edtech is set to change that. Many predict it to be the biggest and most profitable digitized sector the world has ever known. Edtech broadly refers to the use of technological processes and resources to improve education. It comes in forms of products, apps, and tools to enhance learning and pedagogy for all stakeholders in a student's educational journey. Per IBIS Capital, a London-based consultancy says, the Edtech market is predicted to reach $252 billion by 2020. According to Metaari,by November 2017 global investments made to learning technology companies reached over $8.15 billion, which is the highest in the history of the Edtech sector by an extraordinary margin. The New Era of Education Technological change is accelerating at an unprecedented speed and could create a world we can barely begin to imagine. We don't know what careers will look like or how our societies will be organized. This makes much of today's education possibly irrelevant. Even skills that seem 'applicable', like coding or foreign languages, could become redundant as we might discover that computers can code better than humans and that we can use an implant to speak any language fluently. In a world where information is abundant and right under our fingertips, students no longer need to memorize facts. Instead, they need to know how to research and sort through vast amounts of information, decide what's relevant and important, discern, formulate views and write effectively. However, much of current teaching practices don't reflect that. Edtech aims to help bridge this gap. With virtual reality, for example, students can explore volcanoes, caves, the ocean, and travel through space. This offers opportunities for students to travel outside the four walls of their classroom, and saves money and time. VR (Virtual Reality) and AR (Augmented Reality) are helping create an increasingly immersive learning environment with a lot of potential for student engagement. Digital curriculums and using devices in classrooms is rapidly becoming an expectation as students demand more freedom and flexibility in their learning. Furthermore, there's some resistance from parents and educators to using technology in classrooms. For example, American Academy of Pediatrics stated – as a response to the proliferation of online preschools – that higher-order thinking skills and executive functions such as self-regulation and flexible thinking are best taught through unstructured and social (not digital) play (when referring to preschool age). There are some other issues to consider, such as the fact that not all students have equal access to technology at home or at school. The Edtech industry is estimated to be just 2% digitalised. The adoption of technology is, therefore, being hindered by multiple levels of gatekeepers such as teachers, governing bodies and policymakers. The sector will also need to find ways to safeguard students' personal data, as well as face the population growth and the rising need for education for some 2.7 billion students worldwide. The Power of Edtech in Emerging Markets The future is bright for Edtech in developing countries as it provides a very effective solution to the financial and infrastructure-related challenges. Edtech has the power to create efficiencies, cut costs, and enable new levels of democratized access. Issues that plague the emerging markets, such as poor transportation systems and financial difficulties, could be overcome by Edtech. There are still issues though. One of the key challenges in some emerging markets is the lack of mobile phone and internet coverage, even though the coverage has been rising. More than half of children that have not enrolled in school live in sub-Saharan Africa. In certain countries, such as Somalia and Burkina Faso, more than 50% of children receive an education for a period of less than two years. In sub-Saharan Africa, over 12 million girls are at risk of never receiving an education. In Yemen, more than 80% of girls will never have the opportunity to go to school. Gamification has been penetrating the learning space for a while. In addition to helping students interact with the content, it also increases retention and comprehension rates. There is also a growing realization that integrating coding across subject areas can help stimulate computational thinking. On the other side of the world, the Asian education system is booming. In India, the government is heavily emphasizing digital education by implementing programs such as Digital India and Skill India to spread digital access. Malaysia announced in 2016 that primary schools will start teaching coding and China is the biggest investor in EdTech – with investments into Chinese EdTech companies reaching $1 billion in 2017. Many emerging countries, however, still do not appropriate the financial resources necessary to create schools, provide schooling materials, nor recruit and train teachers. Personalized learning is continuing to spread. By using a combination of face-to-face instruction and technology-assisted instruction (and collecting a lot of data), each student will be able to learn in the way that best suits them. Educators are also investigating connected classrooms and modern learning environments as the latest innovation in teaching. While some governments in emerging markets are lagging behind, a number of NGOs and private sector players are making great strides. LangBot, gamified and artificial intelligence (AI)-powered language teaching chatbot, has been named the winner of the Ethiopian leg of global startups Seedstars Worlds Competition. With knowledge and tools available for free or at a low cost, Edtech is indeed democratizing education. Edves is a full-featured school management software from Nigeria. Edves encompasses all of one school's needs (automating processes from enrolment, payment, result processing, e-learning, etc). They were among the winners at the 2017 Seedstars World Competition and were granted the Transforming Education Prize of $50K. Gamification has been penetrating the learning space for a while. In addition to helping students interact with the content, it also increases retention and comprehension rates. There is also a growing realization that integrating coding across subject areas can help stimulate computational thinking. Personalized learning is continuing to spread. By using a combination of face-to-face instruction and technology-assisted instruction (and collecting a lot of data), each student will be able to learn in the way that best suits them. Educators are also investigating connected classrooms and modern learning environments as the latest innovation in teaching. Education is the foundation upon which we build our future. Without education, there can't be innovation or growth. Education plays a key role in building prosperity around the world. And technology can help us exponentially speed-up the process. Everyone has a role to play. At Seedstars, we do that by empowering entrepreneurs who are changing the face of education in emerging markets. Are you bother ed about that perf ect gift to give? FirstBank epaid Pr Car d has got you cover ed! Let your friends and loved ones purchase what they truly e. desir Give them the eedom fr to choose and have your gift truly appreciated. Delight someone this season with a FirstBank d. Gift Car For more information, contact Firstcontact@ďŹ rstbanknigeria.com (01-4485500; 0700347782668228), the near est FirstBank branch or your FirstBank Relationship Manager .